Sold by ROMAUNT and Fulfilled by Amazon. Gift-wrap available. If you are a serious coffee drinker, hope grind just the right amount of fresh coffee by hand will become an enjoyable part of your morning. Buy it, you will not be disappointed. 1. Add a proper amount of coffee beans according to individualneeds and turn the rocker clockwise to carry out grinding. 2. 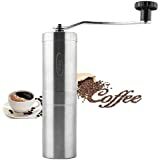 Separate the hand-operated grinder from the cup. 3. Use the brewing & measuring cup to evenly pour a certain amount of hot water into the filter and carry out coffee brewing and filtering. 4. 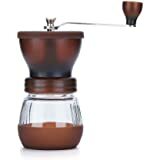 Separate the precision filter from the cup. 6. Cover the cup with the lid and then enjoy a cup of freshly grinded coffee. Good for travel, as advertised. Nice manuel grinder does a good job! Great idea four in one. 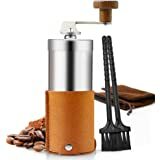 I am a coffee lover, traveling a lot with my friends, this fresh coffee beans grinder perfect for us when we are on the road. It's an easy packable item and very convenient to operate. It can adjust the coarseness of the ground, so i can make a super fine grind that blends into my creams and chololates. It takes a bit of grinding to make coffee for 2 people every time. The filter mesh is too fine which don't allow for coffee grains to get in drinking cup. The only improvement is to the item can't heat the water to brew coffee, you need to pour hot water into it. Not a big problem, but it'd be nice. Overall, i really like this nice quality contraption, very pleased with this purchase. Thanks! 5.0 out of 5 starsWay better than expected, beats my expresso pump! 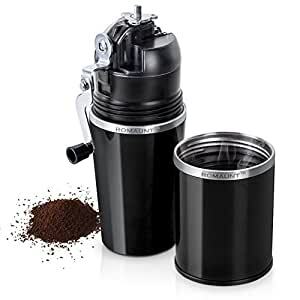 I really bought this for the manual bean grinder, if it makes coffee too then so much the better. I use it on my sailing yacht and camping. 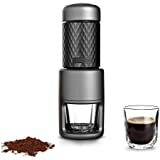 I had already bought one of the pump style espresso makers and I needed something to grind the beans. What I found was that the larger basket on this one allows you to add more grounds and really fix yourself some jet fuel! It actually holds enough for two cups. I have to say it beats my espresso maker! I think both coffee makers are fun and I like to switch around. Grinding the beans by hand takes 3 or 4 minutes, which is not that long but seems like an eternity. I like that though, you put a part of yourself into it. It's a handmade cup of coffee! It's easier if you hold it at base while you grind. You get a little better leverage that way. The handle folds up and everything tucks away nicely when you're done. I think it's really well thought out. I'm thrilled with mine! 4.0 out of 5 starsGreat product but the lid leaks. My only issue is the supplied lid it will not seal or stay in place, and leaks from the seal. Satisfied with the rest of it though. Not sure what to do about the lid as it will leak just with an attempt to drink from the cup when the lid is on. It will also leak as the coffie splashes around in the cup. Other that that so far it seems durable, and I have used it nearly every day since i received it. I just made my first cup of coffee with it. It was very good! It does take a bit of grinding and figuring out the setting of the fine or course grinding. The components all are very well made. If I change my mind in the coming months I'll update. But if I don't update...means I love it! I love that I can freshly grind coffee beans in the time it takes to boil water. 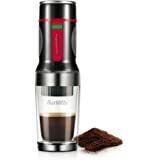 It may take longer than an electric grinder, but the courseness comes out perfect to my personal taste (easy to adjust) and my morning routine results in the best cup of coffee I’ve had next to the cup I had upon arriving in Rome, Italy many years ago. I haven’t traveled yet, but I’m lookong forward to bringing my perfect coffee routine with me when I go.